The Minnesota Vikings framed logo jersey display case is made from a durable, high strength injection mold backing, and then encased by a beautiful brown wood frame. The inner dimensions are 38'' x 29 1/2''x 3'' with the outer measurements of 42'' x 34 1/2'' x3 1/2''. The case comes with a 24" clear acrylic rod that will display a collectible jersey. Officially licensed by the National Football League. The display opens from right to left and is easily mounted on the wall with five screws (not included). Memorabilia sold separately. This nameplate was used by David DeCastro during the 2014 NFL season. It is officially licensed by t.. Celebrate Peyton Manning becoming the NFL's All-Time passing touchdown record leader with this frame..
San Jose Sharks Cue Rack in Black Finish by Holland Bar Stool.. The North Carolina State Wolfpack mahogany framed logo jersey display case is made from a durable, h.. This Riddell mini helmet has been personally hand-signed by Phillip Dorsett. It is officially licens.. 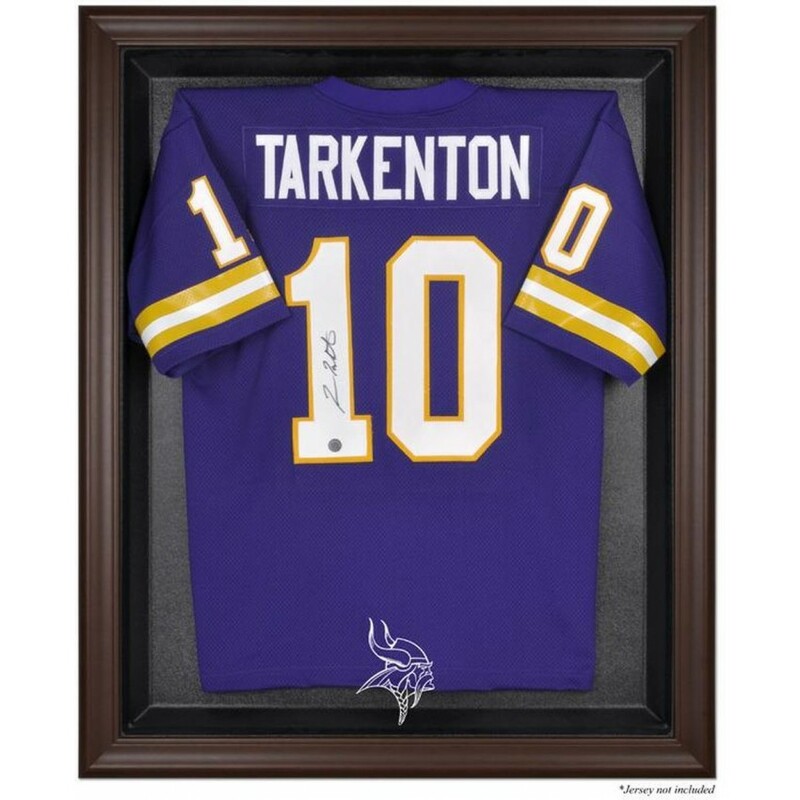 The Removable Face Jersey Display is the newest technology in jersey display cases. This Full size, .. The Maryland Terrapins mahogany framed logo jersey display case is made from a durable, high strengt.. The Washington Huskies Golden Classic basketball display case comes with a black acrylic base, gold ..